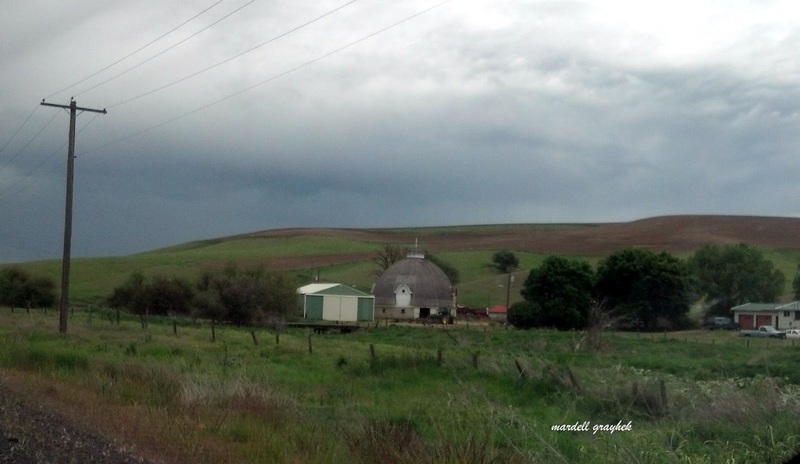 One of our favorite things to do is explore the Palouse farm country through the back roads of Eastern Washington where we live. On Memorial Day we took a drive on State Highway 23 a 66 mile stretch through high desert country and the rolling hills of the Palouse. 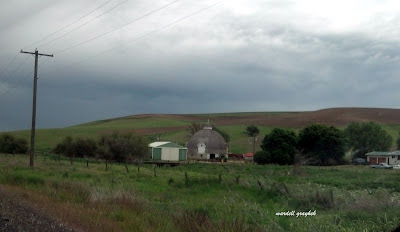 I was so excited to see this round barn on a neat farm not too far From St. John Washington. This barn was built in another era but is in relatively good condition. From our vantage point we could not see its flaws, just the charm one experiences dreaming of simpler times. Many barns along these country roads have not fared so well. The paint is gone and the roofs are falling from the center of the structure. It is a sad sight no matter the story. I think of the young families who built their homes and farmed the land. What was their story? How did they get to this land and what happened that has left no trace of their dreams other than the broken boards of a dilapidated frame. Our area is rich with history. The beauty is such that I appreciate it so much more than when I was a child in the back of a station wagon wondering when we would get wherever we were going because I was getting car sick on those old two lane roads before the Freeways of today. My father-in-law was a lineman for Pacific Northwest Bell after WWII and worked throughout the area adding poles and lines for our precious land lines. 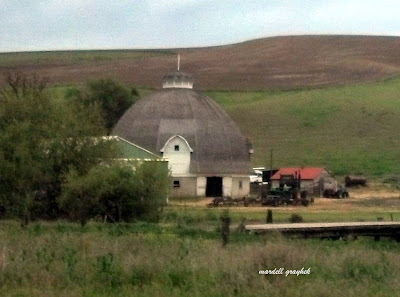 He has told of other round barns, he thought there were about three. I am on the lookout for the other two from this day forward! What stories these rounded walls could tell! It is fast approaching the end of May and I have not been out in my garden yet! The spring bug that hit me last month lingered like a relentless suitor. It is a relief to be past all of that. The Lilacs have bloomed and faded, paving the way for the perennial beds to begin their summer showcase of color. There are plants to transplant or simply dig up because of the threat of a heavy coup in an unplanned area. 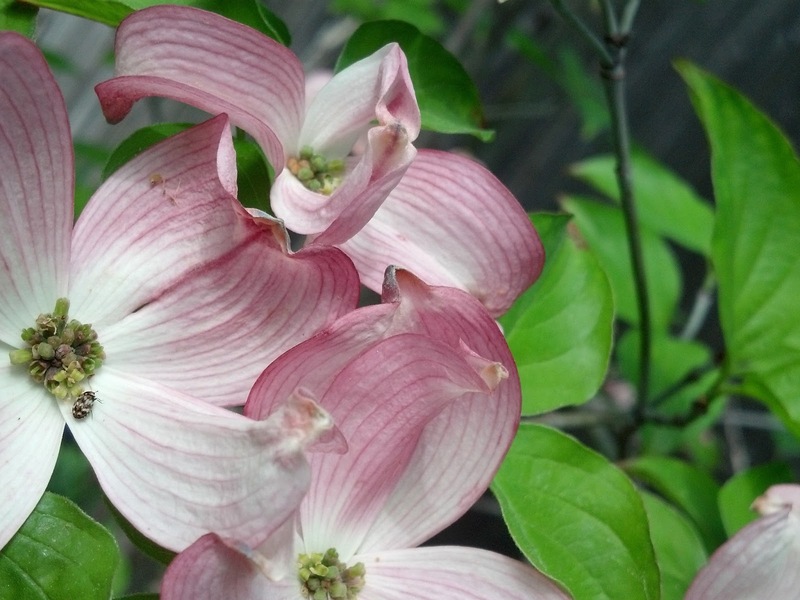 My Dogwood is in bloom and I expect it to last through the next week. I received the tree as a gift from four of my sisters when I graduated from college 5 years ago. It is a slow grower but I am savoring the blossoms every year as more blossoms show up on its branches. Such a wonderful reminder of how great and wonderful our God is to shower us each season with natural beauty. It is there in abundance when we look for it. Here is a picture of the Dogwoods offerings this year. Is Your Childhood Home Ever the Same? I had time to kill before I went to my temporary job assignment this morning. It is within a mile of the house I grew up in so I had plenty of time to stop and have a look. For a number of years I have meant to stop and ask the owners if I could take a rubbing of my brother's footprint on the sidewalk leading to the house...the footprint of an eager child tempting the fate of wet cement. He had red hair and all the charms a little boy can possess with a mischievous little smile. Growing up I would run up that sidewalk and put my foot inside the footprint, hoping that finally my foot would fit perfectly. It was a wonderful game, all the sweeter because this was a brother I never met. I was born ten months after he passed away in an accident inside our home. he was three months shy of his fifth birthday. It was a freak accident in a home full of running children and a multitude of remodeling projects. In those days, great big old houses were remodeled to look new inside. The sheet rock of choice was double lathe plaster and a few sheets were stacked along the wall in the long hallway. Unfortunately, those sheets fell on him and he was killed instantly. I can only imagine how things changed but one thing I know for certain is that I don't want him to ever be forgotten. That footprint though, is no longer there. I wish I had gone there years ago. The sidewalk that is there now is not new. It is old. It is pitted. I had to remind myself that the footprint was made more than sixty years ago. I have not lived there since 1969 when I graduated from high school. The curb we had so much skipping along is crumbling...and there is a house in our garden. The Lilacs are all gone too. So too is the huge crab apple tree the older kids climbed up to secretly smoke, telling us they were playing rocket ships. Every thing is changed and why not! It is a whole new era. However, when I was younger a family who had lived in the house before us were happy to see the garden thriving, the Lilacs blooming and the apple tree so tall. The flowers circled two Honey Locust trees that shaded the house ( now gone) and the grass just rolled so thick to the border of the garden. I am sentimental, sometimes sad, but I realized that time has really gone by and I still have my memories, sweeter than the reality of that sad street I saw this morning. And it is okay. Ringing in Spring Cold Season! This is what I have been up to this week! The hair is all wrong but when you feel as bad as I do it doesn't matter....everything is off. I cannot remember when I felt this bad. I am not looking for chicken soup or easy to read magazines or puzzle books to pass the time. 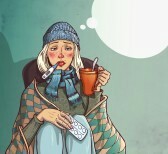 I am just amazed how a cold can be so miserable! While I ply myself with water, cough drops and cough medicine the usual forms of entertainment just aren't cutting it. It all started with lovingly babysitting my granddaughter who was too sick for daycare. We spent time cuddling and I made her comfortable while she was here. Lots of books and a video or two. I never dreamed I would get sick. This has never happened in the fifteen years I have been a grandma! I do not blame her, and I would probably help out again. I think I have finally gotten the answer to the question "What really happens if you are sleep deprived?" It is definitely time to take my insomnia in hand and learn to get true rest. I need to beef up my immunity! No two ways about it. What is the answer? a sleep journal? Drugs? Goodness I am not going that route! I will think about it later. I can't concentrate anyway.